I think we must devour these healthy low carb beef tacos at least twice a week in this household. They take no time to prepare and pack so much flavor that it feels like eating comfort food – just without the guilt. They’re versatile too: a healthy dinner ready in 30 minutes? Yes, please. Leftovers for breakfast (with a cheeky fried egg on top)? Ohh, yes! Something you can easily adapt for slow carb, keto, paleo or LCHF? Check, check, check and… check. AND, as a bonus, there’s a 10-minute simmering time at the end that’s just the right amount of time to throw together the ingredients for my lightning quick salsa and guacamole recipes. In short: it’s a great healthy option for your next Taco Tuesday. 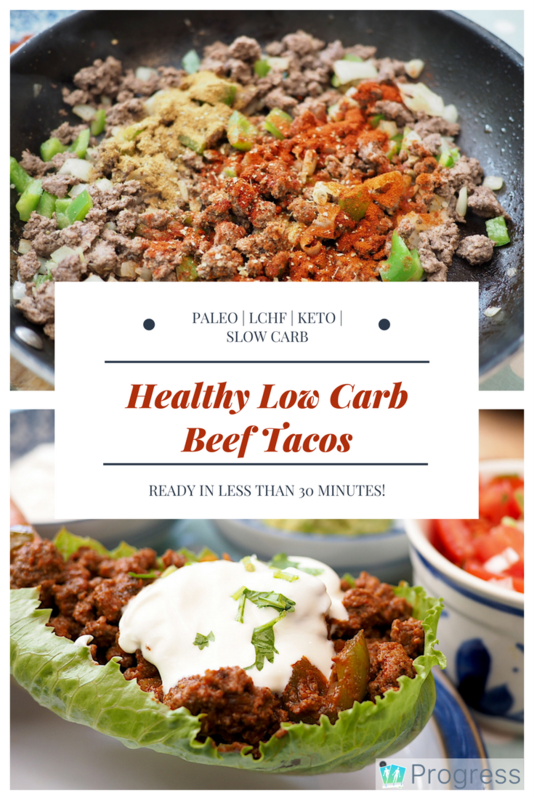 We never tire of eating these low carb beef tacos – I hope this will become one of your go-to weeknight recipes too! That’s pretty much it for the tacos apart from a final taste test and seasoning. If you’re making the guacamole and salsa, use the simmering time to prepare them - if not, skip through this next section to the final steps. Dice all 3 tomatoes (setting aside one for the guac) and finely chop the cilantro, including the stalks. Now the taco mixture has thickened, it’s time for a taste test - I usually add another tablespoon of cumin at this point because I can’t get enough of the flavor, but feel free to add whatever you like. To serve: scoop the mixture into the lettuce leaves, top with guac and salsa (if you’ve made them) and enjoy! 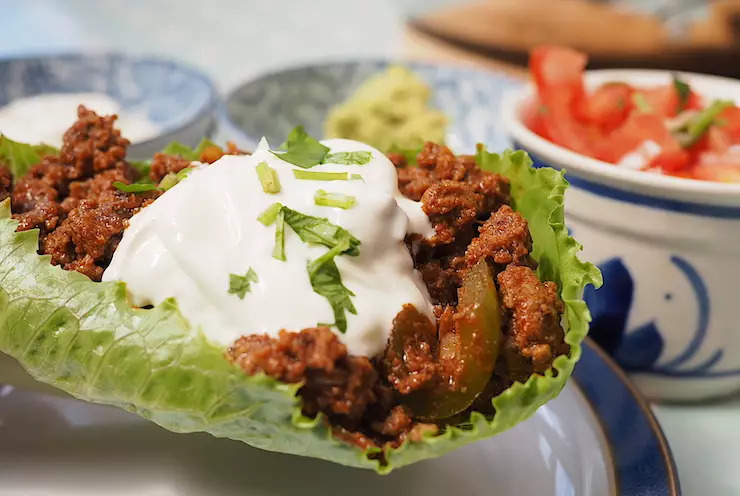 Or, if you’re not being careful with carbs, simply nix the lettuce in favor of crunchy taco shells, and add the works: beans, sour cream and cheese. And there you have it: fabulous low carb beef tacos in less than 30 minutes. 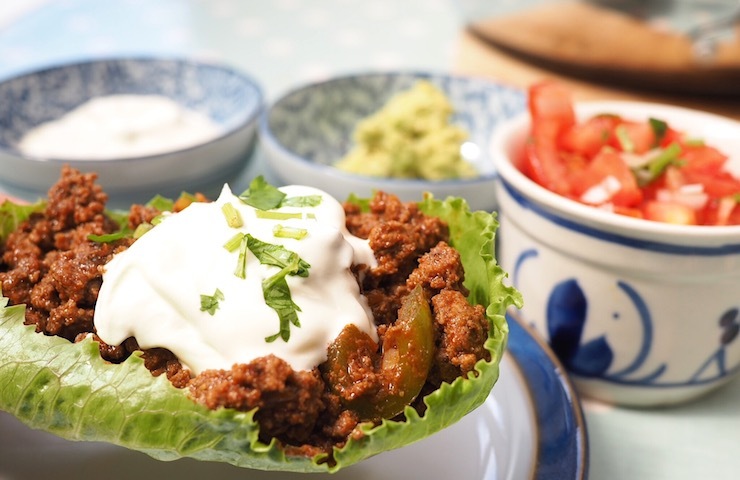 If you like this, why not check out more slow and low carb recipes in our round-up of 10 Quick and Easy Dinner Recipes? Or find out more about the Slow-Carb Diet with our beginner’s guide.